Jalebi Movie Review: The film, which also stars Digangana Suryavanshi, is a film about love, loss and liberation. The film opens with the shrill wail of a distraught woman. It - the film, not the wail - continues down the same emotive path for the next nearly two hours with a girl, who is a successful writer of bestsellers, not only mourning a lost love, but also ruing the sheer futility of life and even contemplating suicide. But mercifully, Jalebi turns out to be more about a lady who learns, with a little bit of prodding, to take a personal setback in her stride than about one who has given up altogether on her future. While Jalebi, directed by debutant Pushpdeep Bhardwaj, seems to be prone to bouts of overt sentimentality, it does not turn into an outright romantic sob story thanks to the elements of stoic lyricism that the screenplay (by Kausar Munir and Bhardwaj) injects into the story. The film, pitched as "a tribute to Rabindranath Tagore" (well, well), advocates the belief that true love lies not in the act of possessing, but in the generosity of liberating the beloved. 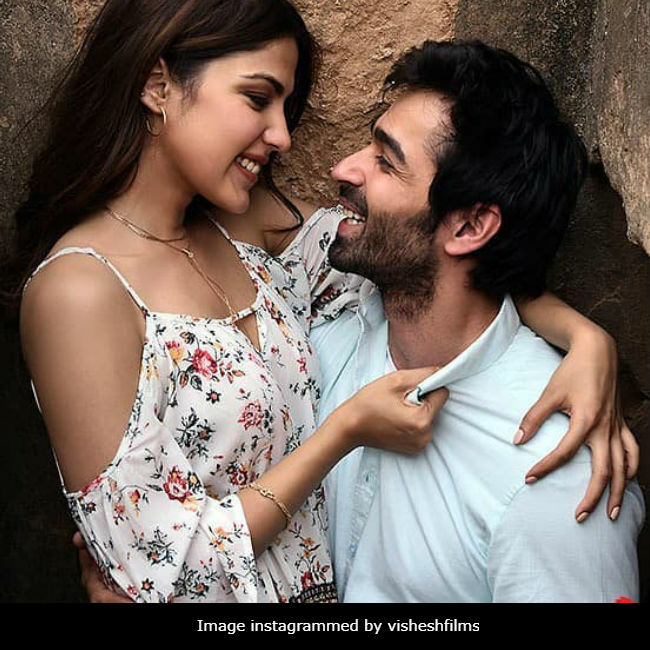 The final impact of this story of a broken relationship offering life lessons is, however, undermined considerably by the erratic quality of the acting from a cast led by two first-timers, Varun Mitra and Digangana Suryavanshi, and a still-raw Rhea Chakraborty. A loose adaptation of the outrageously regressive Bengali film, Praktan (2016), which starred two popular Tollygunge stars Prosenjit Chatterjee and Rituparna Sengupta, Jalebi steers well clear of the social backsliding that one witnessed in the original. It refrains from celebrating the lure of domesticity and instead advocates freedom for the girl who walks out of a marriage with only a duffel bag to seek out her own pastures. Here, two women - one separated from the hero, the other his current wife - are in control although the former indulges in a fair bit of fulminating in the course of a train journey to Delhi, where she is scheduled to take part in a book reading session. The married woman, in contrast, is at peace with herself. She is more than contented with the deal that she's gotten from life thus far but does not feel the need to preen. Memories of a marriage gone sour comes rushing back to the budding writer because she runs into her ex-husband's wife and seven-year-old daughter, who are travelling in the same AC first class coupe. A series of flashbacks serve the purpose of piecing together her back story, which begins with her meeting her would-be husband, an Old Delhi lad and history grad who revels in hosting walking tours of the neighbourhood he has grown up in and loves more than his life. Love blooms between the two and culminates in marriage although Dev Mathur (Mitra) and Aisha Pradhan (Chakraborty) are poles part temperamentally and in terms of upbringing. The man is rooted to his home and its environs; the girl is a free bird looking for escape into the big wide world. This marriage of unlike minds is destined for a messy end. The two drift apart as Dev is torn between his mother and his wife. The brief encounter with Dev's wife Anu (Suryavanshi) revives Aisha's pangs - what she feels is a mix of deep regret and seething anger - and she fights the urge to explode and pour her heart out to the first person in sight. While an old man travelling with his wife recites Muneer Niyazi's Hamesha der kar deta hun main, Dev, in a crucial flashback, chances upon the quote: "If you love a flower, don't pluck it, water it." Jalebi is a film about love, loss and liberation that chooses a radical direction before the curtain is rung down. As the three principal characters negotiate the complications that arise on this Mumbai Central to Hazrat Nizamuddin train ride, the drama never rises to a genuine crescendo, which will obviously prevent Jalebi from endearing itself to the masses that favour livelier enticements. But there are flashes in the film - admittedly these are few and far between - that suggest that Bhardwaj is a director who is capable of delivering offbeat fare within mainstream narrative formulations. Among the more striking features of Jalebi are the silences that if offers the audience to balance out the melodramatic scenes and the musical score that opts for serenity over foot-tapping noise - two more reasons why the film might feel wearisome to some. But we'd prefer the love-yatris of Jalebi any day to the ones that we encountered in that horrendous 'youthful' yarn that was foisted upon us last week. If this film isn't as crisp as a jalebi fresh off a Parathewali Gali frying pan, it is because the human tools at its disposal aren't top-draw. Varun Mitra has the potential to take on more challenging roles. Ditto Digangana Suryavanshi. Rhea Chakraborty is fine until she is prancing around or is engaged in light-hearted banter, but in the more intense scenes, she exposes more than a few chinks. She still has some way to go before she can be regarded as a finished article. Jalebi represents a marked improvement on Praktan in terms of gender dynamics. But those that haven't been subjected to the brazenly atavistic Bengali film, the major changes that have been wrought in the underlying thematic emphasis of the original construct will count for little. Jalebi will still, in all likelihood, be treated as a small, starless film unable to fully whet the Bollywood fan's appetite for entertainment.